📷L-R, Jim Waddick, Joe Coan, Roberta Watson, Bill Pioppi and Ron Delage gather near the Sturbridge Community Food Collaborative garden. SOUTHBRIDGE – The Head Cabbage, Beet Guy, and Mr. Potato gathered Monday, Sept. 10 to discuss their successful first year at Sturbridge’s Community Food Collaborative, located at 8 Maple Street behind the Sturbridge town hall. The group’s Bean Counter couldn’t come to this event, but he contributed to the collaborative’s debut growing season in many ways, according to their peers. 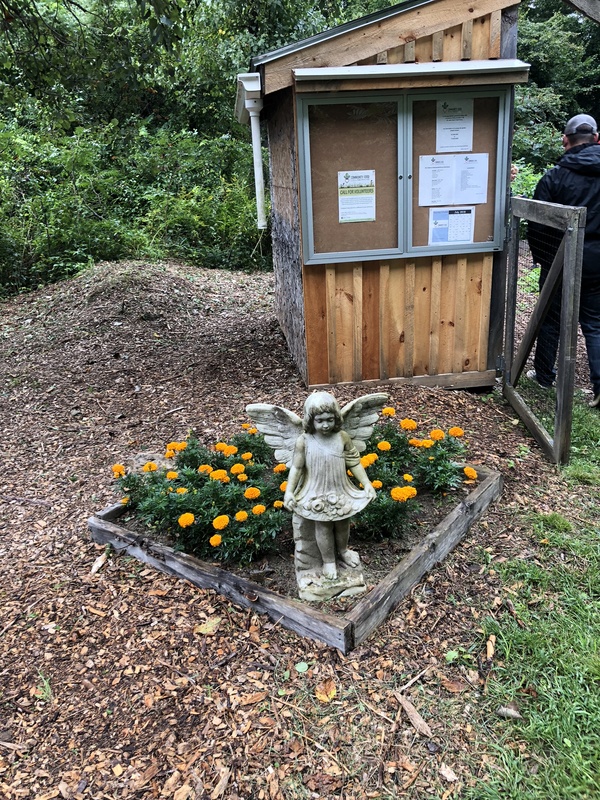 A garden angel figure guards the shed and the entrance to Sturbridge’s Communith Food Collaborative Garden. These are not children’s show characters or anthropomorphic legumes that we are talking about. Rather, these are the humorous nicknames that leaders of Sturbridge’s Community Food Collaborative have adopted. 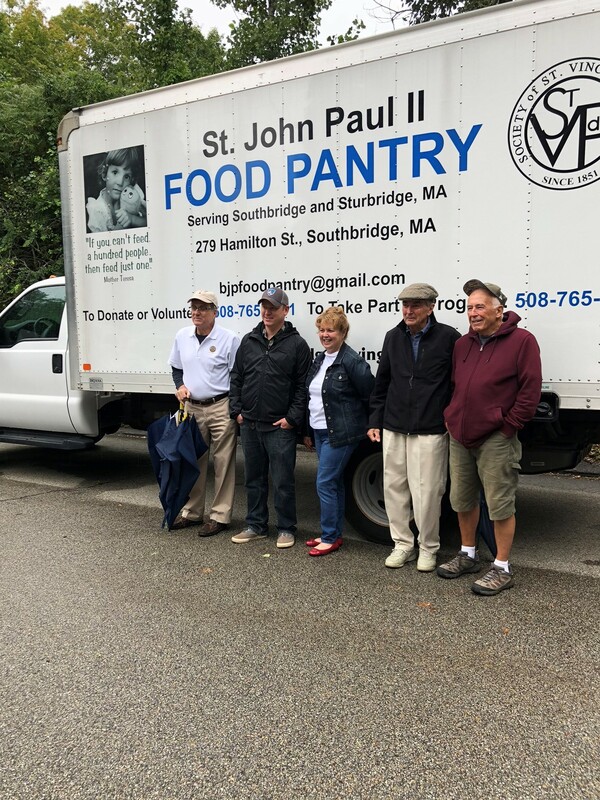 President Joe Coan is The Head Cabbage, James Waddick is Beet Guy, public relations coordinator Pauline White is Lettuce Tell All and Bill Pioppi, Saint John Paul II Food Pantry Coordinator, is Mr. Potato. The funny names fit the friendly and positive outlook of the group, which began conceptually in 2017 and started its first growing season in spring 2018. 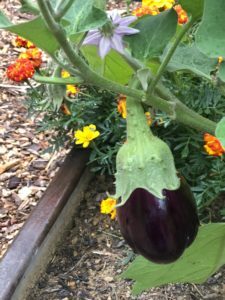 The Community Food Collaborative has guided the growth of a variety of fresh fruits and vegetables this past year to benefit partner organization, the Saint John Paul II Food Pantry in Southbridge. The collaborative is “the first stand-alone, volunteer-driven project of the Rotary Community Corps of Sturbridge and Southbridge” with more than 90 volunteers. A variety of sponsors, volunteers, and community groups looking for engagement projects have made the garden grow. 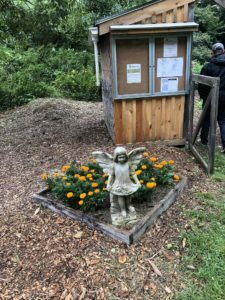 The garden is all-organic and is located on more than an acre with raised garden beds and a storage shed at the entrance. It is located on land owned and provided by The Sturbridge Federated Church, although you can access the plot by parking in the overflow parking lot tucked behind the Sturbridge town hall. Pioppi, of Saint John Paull II Food pantry, reflected on the need for the local food pantry services, and partners such as the Sturbridge Community Food Collaborative. “We would want to reach a point where we are no longer needed. But unfortunately, the reverse is happening,” he remarked, noting increased use of the food pantry in recent years. Roberta Watson, also of the Saint John Paul II Food Pantry, described the joy she takes in being at the pantry when clients reach the area with fresh produce. The pantry is set up like a smaller version of a grocery store, with shelves lining aisles of the pantry and grocery carts that clients may take through the aisles to choose foods that suit their family’s needs. At one end of the retail-like experience is a section with fresh produce, much of which comes from the Community Food Collaborative. An eggplant grows among the fresh produce in the garden. Watson describes the scene as resembling a busy city market, alive with several languages and conversation, and notes that she enjoys the atmosphere. She said she is often surprised that the children visiting the pantry can identify all of the fresh vegetables and that they show enthusiasm for receiving the freshly polished organic produce. A variety of volunteers and donors contributed to the first successful year of the Community Food Collaborative. Much like the fun nicknames for the leadership officers of the group, sponsors select a level of contribution that includes “Hot Pepper”($500 or more), “Sweet Potato” ($250 – $499),”Spinach” ($100 – $249) and “Green Bean” ($0 – $99). Various community groups adopted beds in the garden, including a Girl Scouts troop which learned about gardening and food production alongside its community service project. Other groups made in-kind donations or provided help maintaining or harvesting the produce for delivery to Saint John Paul II Food Pantry. As the Community Food Collaborative wraps up for the season and celebrates a successful year of community outreach, member Pauline White (a.k.a. “Lettuce Tell All”) encourages businesses, community groups or individuals to reach out to learn about how they can contribute or volunteer for the 2019 growing season. Those interested in learning more can visit www.cfcgarden.org or send mail to P.O. Box 357, Sturbridge, MA, 01566. More information is also available on the group’s Facebook page, and a PayPal donation link is also available.